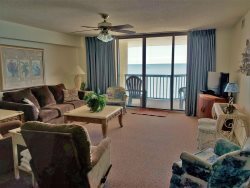 Enjoy your family vacation in this 3 bedroom oceanfront condo at the TideMaster in North Myrtle Beach. Located close to Main Street in the Ocean Drive section, you're just a few minutes' walk away from dining, boutique shops, and family activities. Amenities include 3 TVs, DVD players, WIFI internet access, full kitchen with breakfast bar, and covered balcony. There is also an outdoor pool and kiddie pool for you to use during your stay! Enjoy awesome ocean views from the living room and master bedroom. While on vacation, check out the local hotspots - just a short walk up Ocean Boulevard. TideMaster is within a close drive to all the popular restaurants and attractions along the Grand Strand. Plan your summer vacation, SOS event, or winter residence at Tidemaster 501 and take advantage of disounted dining and attractions through our own Endless Fun Club! This prime location if perfect for a large family or 3 couples. Call today to plan your trip!